Søren Gemmer was recently asked to write the liner notes to second album of Swedish trio of Anders Persson, Palle Danielsson and Terje Sundby, ‘The Second Time Around’, released on Imogena (IGCD 197). The idea came about when Persson, then teacher and mentor of Søren Gemmer, handed over a copy of the trio’s first album ‘Lonely Fungus‘ to Gemmer. The beautiful and touching liner notes to the album were written by the late Esbjörn Svensson, the swedish pianist of EST fame who was a devoted fan of Persson’s. The album itself was a perfect demonstration of Persson’s abilities as a pianist, arranger and composer and featured the legendary playing of Palle Danielsson as well as that of long-time friend of Persson’s, Terje Sundby. As luck would have it the trio ended up on stage together year’s after the studio session for ‘Lonely Fungus’ and the concert was recorded by Swedish national radio, SR. The resulting release once again demonstrates the groups ability to play songs, and to fully convey the emotional message of jazz standards and originals alike. The lyrics of Jimmy van Heusen’s ‘The Second Time Around’ speak the essence of the music presented on this album. It seems to hold a perfect balance between a sense of groundedness coming from experience and the sudden outbursts of newfound love – of music. Listening to the title track, for instance, one hears the ease and calmness of the melody presentation; rich with the subtle details in harmony and orchestration that separates the men from the boys of trio playing. Yet midway through the piano solo it seems as if ‘tried and tested’ makes way for a sudden realization of the greatness of music itself. The improvisation startling the improvisers, the improvisers startling each other and music once again presenting itself as something to fall in love with all over. 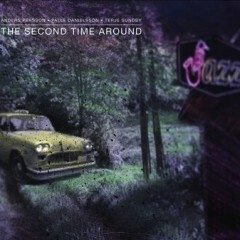 On another more prosaic level ‘The Second Time Around’ refers to the fact that the album is a follow-up to the studio recording released under pianist, Anders Persson’s name, ‘Lonely Fungus’. This live recording came about by coincidence eight years later, but the level of playing and affinity among the musicians makes one hope for a Third Time Around! Enjoy. < < Previous Post: Back in Oulu!